With staggering more than 3 million subscribers in his Youtube channel alone, Sungha Jung is one of the most successful teenage finger style guitar players in the world. His guitar rendition of pop music, contemporary, jazz and classical tunes have been viewed more than 1 Billion times around the world. He was given nicknames such as “Guitar Prodigy” and “August Rush” in Korea through the popular television program. “Star King”. Sungha Jung began to play the guitar after watching his father playing it. Then he was introduced to finger-style by his father when he found it on the internet which later he developed the interest towards it. He improved his skills quickly by watching, learning and covering songs of famous finger-style guitarist such as Ulli Boegerhausen, Andy Mckee, Tommy Emmanuel and Kotaro Oshio without any reading material and just by using his ears and eyes on the videos. Sungha’s journey to become a star when his rendition of “The Pirates of the Caribbean” theme song was viewed more than 50 million times on Youtube, making Sungha an internet sensation. Sungha has also been receiving guitar lessons and advice from other re-known guitarist such as Kotaro Oshio and Tommy Emmanuel but he has been mentored by a German guitarist Ulli Bogershausen, whom Sungha refer to him as his musical inspiration and from whom he learnt much about music composing. In addition to steel-strings and classical guitar, he has been playing the 12 string guitar, electric guitar and ukulele. He has made several performances by performing with his electric guitar and ukulele in his concert. He sings as well and he sang John Mayer’s “Why Georgia” at a concert in Indonesia and Malaysia in 2014. 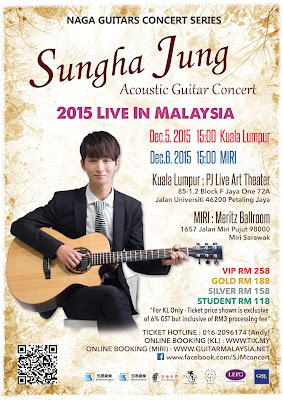 Since then, Sungha has been touring in his sold out concerts around the world and has performed with other artist such as Jason Mraz, 2NE1, Big Bang, Tommy Emmanuel, Youtube Stars Sam Tsui and Kurt Schneider. Sungha also appeared in a Korean movie in 2011, “The Suicide Forecast”. There will be no changes or cancellation once tickets sold. Lucky draw is only valid for VVIP holder only. VVIP ticket holders will entitle a free autographed CD and a photo session with Sungha Jung himself. Please take note that the photo session will start at 1PM in the concert date. The management will arrange the best seats based on 1st come 1st serve basis after the payment has been done. Student card is needed to get the student discount. Please email your student card along with your booking number to andyngew89@gmail.com.